Banjax is a humanist sans serif typeface created and published by Paulo Goode which is available in 9 weights in both roman & italic styles. It has a wide range of OpenType features, over 1100 glyphs in each of fonts and language support. With a calligraphic in structure it is suitable for branding, display, headline, text, web etc. Price: starting from $25,00 for one font to $180,00 for all 18 fonts. 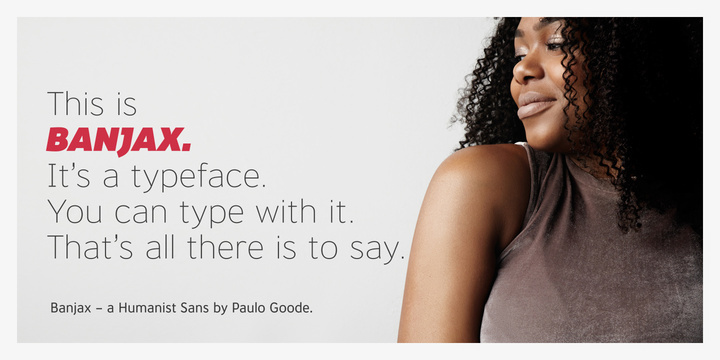 A font description published on Tuesday, September 19th, 2017 in Fonts, Paulo Goode by Alexandra that has 2,504 views.